A powerful performance by the Futsalroos saw them finish with a comfortable 7-0 win as Kurukuru tasted their first defeat in international futsal in 2 years. The match was also their first outside of the Pacific since 2009. The first half was a more evenly fought as Australia only managed only a narrow 1-0 lead over Kurukuru courtesy of a shot that deflected off James Egeta to beat Anthony Talo. Kurukuru managed good possession throughout the first half but attempts at goal failed to threaten the Australians. The second half opened badly for Kurukuru as the Futsalroos took their lead to 2-0. The Australians then moved to dampen any hopes of a comeback by scoring 3 goals in a span of a few minutes. Two more goals from the Futsalrools wrote the Kurukuru out of the match and the final whistle confirmed the Australian’s dominance of the encounter. 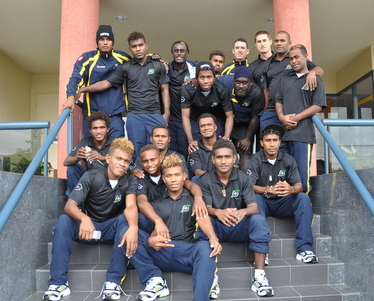 Kurukuru coach, Dickson Kadau, while admitting defeat to the Australians was not too concerned about the result. “I will not offer any excuses because the Australians played a great game today and deserved the end result. For my team it has been a while since we played against international opposition like this and the game today is a reference point for us as we build ourselves up to the world cup,” Kadau said. “We have time to improve upon the weaknesses that we saw and this game will play an important role in helping us be a better side. I am sure my players will take the positives from this game and look forward to the world cup with optimism,” Kadau said. Team captain, Elliot Ragomo, thanked his players for their effort and said that the result is one sided but it does not tell the entire story of the match. “Of course, the final result is what matters but I must say that I am happy with certain aspects of how we played against Australia. We lost concentration in certain moments in the game and against an opposition like Australia we cannot afford to do that as the final score line shows,” Ragomo said. “In this match we had to adapt to a lot of things – the court is much faster and also much bigger. This made it difficult for us to gauge our passes and our shots on goal. I am confident that we will improve as we continue with our preparations this month,” Ragomo said. Kurukuru will head on to Spain to continue their training camp and play more friendly matches. The team left for Spain on today and will arrive on Friday. They will spend 11 days in Spain before heading for Thailand where the 2012 FIFA Futsal World Cup will take place.